Well who knew? The 73 bendy bus is not only an entirely horrible form of transport, it is also a time machine for yesterday it carried me from my office in Islington all the way to Gower St but also back into the 1970's. It's my birthday today. 42 years old and this morning, I feel every damn one of them and hungover to boot. Last night, as is our tradition, Hermano Primero treated me to supper. We met up at 6.30pm in The Mirror Bar of The Landmark Hotel. This is one of the most beautiful hotels in London also one of the most expensive. In truth, though, the bar is pretty grim,an afterthought , I suspect, and the drinks were not very good at all. So we decamped to The Cellar Bar in the same hotel and drank a bottle of Tattinger before heading to Oslo Court. Oslo Court is, as so many people have described, the restaurant that time forgot. It remains proudly in the 1970's resplendent in its salmon pink livery, its silver service and its classical heart attack inducing dishes. It stands in the ground floor of a block of flats called, er Oslo Court for whose residents it used to provide food not entirely unlike this I imagine. Its main clientele seems to be Jewish people out for a celebration and the flash of cameras is as much a part of the night as the food. A lot of reviewers have revelled in its kitch glory. But, for Dos Hermanos, it was not that much of a shock. 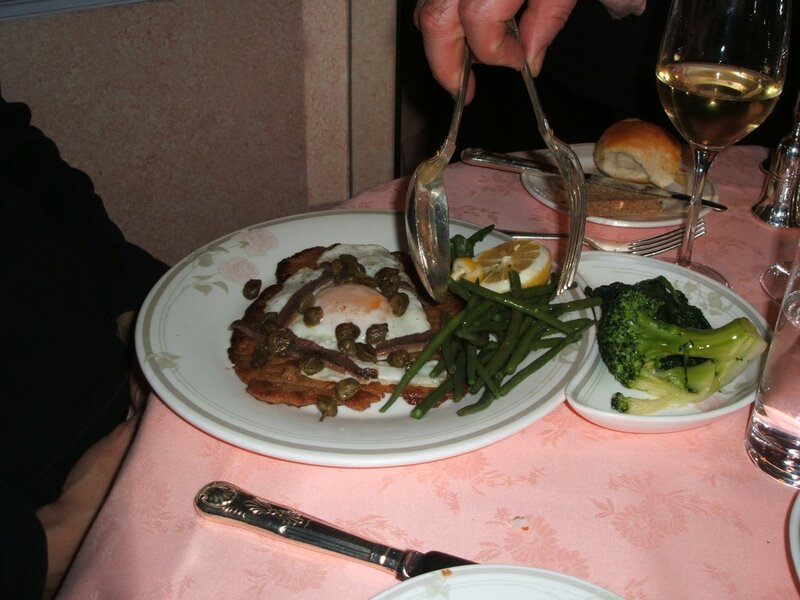 It reminded us of Valpariso on the Costa Del Sol and a restaurant near Barnsley called Brooklands ( favourite haunt of Umpire Dickie Bird) restaurants of which my parents were inordinately fond. Exactly the same schtick. Lots of large pepper pots and lots of elderly ladies being asked if they are old enough to drink and loving every moment of it. That is the one thing that stands out about Oslo Court, people having a damn good time. So many restaurants take themselves so seriously and have an atmosphere that is positively funereal. Not Oslo Court. It is noisy, joyous and hugely good fun. And you know what? The food is really rather good too. Old school for certain, but decent ingredients and prepared with no shortcuts. I have always been a sucker for that kind of cooking. They seem to have about 100 dishes on offer. 10 on the menu and the rest reeled off in impressive fashion by the owners daughter. All come from times past and all sounded great. Seated in a little alcove we had a great view of the rest of the place and nibbled happily on some melba toast, some crudites with excellent mayonnaise and some garlic bread while we pondered on what to eat from the extensive list. HP began with a Lobster and Crab Salad. It was HUGE which seems to be a feature here. 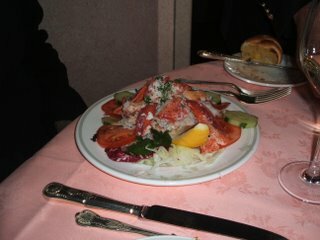 Lots and lots of fresh lumps of lobsster and crab, it was a challenge to finish it. I went for a Coquille St Jaques. I had not seen one of these on a menu for 20 years. It was everything I recall from my younger days. 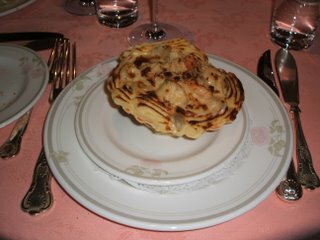 Creamy sauce, lots of mashed potato and a filling of sweet small scallops and prawns. Again, a struggle to finish. How did people used to eat like this? The main courses were just as much of a challenge. For HP a Veal Schnitzel Holstein which came, as it should with capers and anchovies and a fried egg on top. For me crispy roast duckling with cherry sauce. Both enormous portions which even our gargantuan appetites struggled with particularly when the mounds of vegetables arrived. Battered courgettes, spinach, chips, green beans and on and on. It is not so much a meal. More an assault course. We did not come close to finishing what was offered. We just about managed to polish off a bottle of Protos Grand Reserva, but were struggling by then. Then the fun really began. 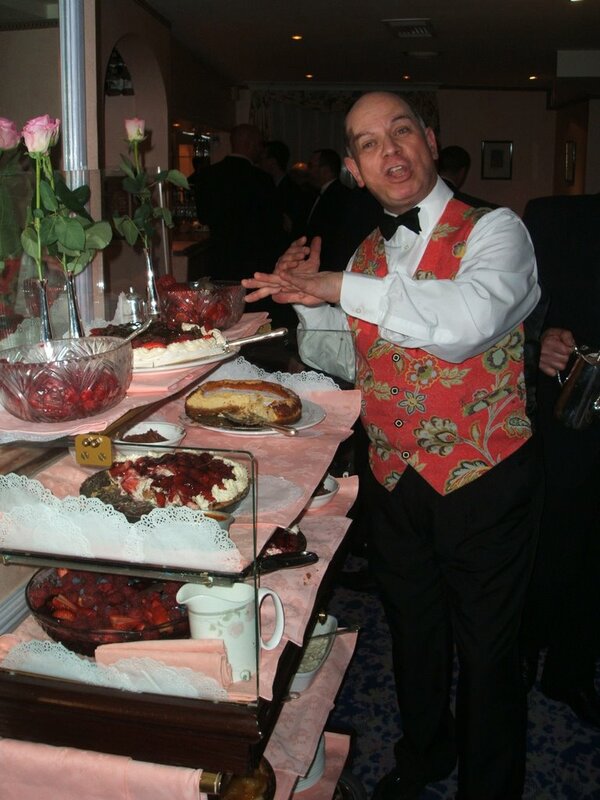 The dessert waiter at Oslo court ( pictured ) is the campest man I have ever encountered. I did not understand a damn word he said, but I am sure this is where Graham Norton is going to end up when his 15 minutes is over and this guy retires. The trolley has everything you would imagine. Mounds of profiteroles, tartes, cakes, fruit salads etc etc. HP chose a creme brulee. I had something that consisted entirely of double cream and raspberries. The comped us some glasses of dessert wine with the puds. I could barely touch it as I was reeling by this point. Some fresh mint tea and some coffee later, we staggered out of there, back into the present day and poured ourselves into a cab. So drunk that I forgot my holdall and HP kindly offered to cab it there and back to collect for me as I was, quite frankly, in no state. So, there you have it. The first time Dos Hermano have failed to polish off what was offered that I can recall. If I have many more meals like that, I am not certain I will be here to write about my 43rd birthday. But, what fun. Well, well ... I'm surprised that Oslo Court even appears on the Hermanos Radar Screen ! I went here twice, back in the 1980s, and it seems it hasn't changed a jot. 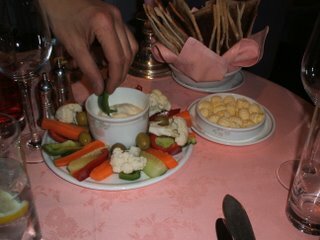 In fact, I'm sure that I had the roast duck in cherry sauce too, and I vaguely recognise the dessert waiter. 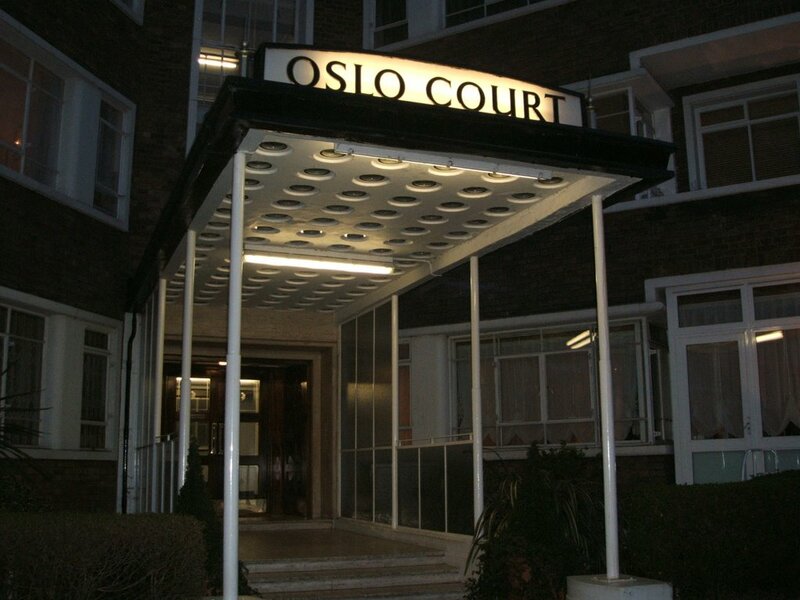 Oslo Court was always a twilight-years residential development for vaguely wealthy Jewish couples and widows. It was always widows, never widowers, because Jewish husbands were not allowed to outlive their spouses in those days. Just not the done thing at all, and since they couldn't cook anyway there just wasn't much point. 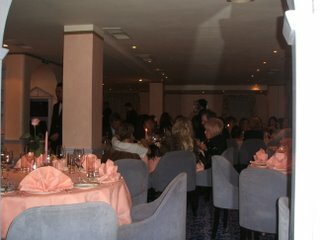 The restaurant was originally established for the benefit of the residents, but I think that as the residents slowly discovered that there were restaurants outside the building, demand reduced to the point where Oslo Court decided to open its doors to non-residents. It seems that the traditional portion volume has been retained. I'm glad that you and Bruv1 managed to leave some food on your plate, because anything else would be deemed by the chef to be a gross insult to his hospitality. 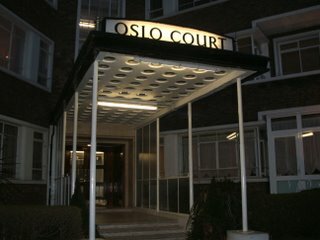 And that was always the key to Oslo Court's success - it was like being invited to a barmitzvah or to a friend's house, and being made to feel relaxed and welcome. Nice to know that's still the case. Oh, and I forgot .... happy birthday to you H2 ... de dah de dah de dah .... it doesn't seem like two years since Mela !!! Happy Birthday Dude.Loving your work. Don't be a stranger to Cornwall. Welcome to the shtetl, we're pleased you enjoyed your stay. Do come again.